Go to YoPlus.com to sign up for a free YoPlus Yogurt. The one shown in the picture is Blackberry Pomegranate. Void in some states. Once again, participating IHOPs will be celebrating National Pancake Day by offering a FREE Short Stack of Pancakes (3 pancakes) on Tuesday, February 23rd from 7AM – 10PM. Not valid with any other offer, coupons or discounts. All they ask is that you make a charitable donation to the Children's Miracle Network while you are there. FREE Fresco Taco at Taco Bell. Expires seven days after printing or when 1 million coupons are printed and redeemed. Print your coupon HERE. One per person. Razor Scooters $15.75 at Amazon! Final Price = $2.00 ea. Campbell’s Select Harvest Soup $1.25 ea. *look for specially marked packages that include a coupon for FREE Dominos pizza! El Rico's Restaurant Family Night Buy 1 Adult, get 2 kids free! El Rico's Restaurant in Queen Creek has a great Family Night special every Monday night! Buy 1 Adult meal, get 2 Kids Meals (including drinks) free! This is actually a really awesome deal! Their meals are huge and the food is fabulous. Their building is beautiful, built by their own hands....and includes a second story balcony area, and a grassy amphitheatre outside! My favorite thing about El Rico's is their made fresh daily tortilla chips and salsa. My mom seriously drinks their salsa straight from the bowl. Gross? Maybe. Delicious? Absolutely. There is a coupon for $3.00 off Cloudy With A Chance of MeatBalls DVD on Redplum.com This movie comes out this week! It looks like it is only $15 at Target. Print yours now before they're gone! Today's SS had a coupon for $2.50 off Electrasol. These are $3.49 @ Target. Final Price after coupon is only .99¢ ea. Free Ticket to Disney Parks! You know it's the real deal when even Pres. Obama is talking about it. 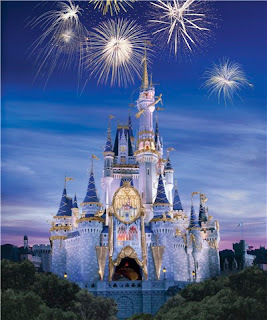 Just go to DisneyParks.com to sign up for a volunteer activity to qualify for a free ticket to Disneyland or Disneyworld. Up to 8 people per family but you must be at least 6 years old. Buy three specially marked Kellogg's® cereals and get $10 in bonus bucks to spend on electronics, toys, sporting goods, books, concessions and movies! 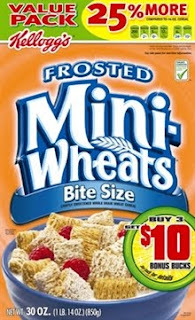 Watch for specially marked boxes of Kellogg's cereal for the big 30 oz. boxes. The front of the box has a big green and yellow circle on the bottom right side that says "Buy 3 get $10 bonus bucks". These have been spotted recently at WalMart for $2.88 each, but watch for them at other stores as well. Purchase 3 boxes, then you enter the unique codes from the boxes at www.kelloggbonusbucks.com and get a $10 certificate to use at Target, Walmart, Albertson's, movie theaters, and a variety of other places. To summarize the offer if purchased at WalMart - in the end you're getting 3 30 oz boxes of cereal at $2.88 each = 8.64 + tax. Then get $10 back to spend! Your Bonus Bucks certificate will arrive via 1st Class US Mail in approximately 4 to 6 weeks. There is no limit to the number of Bonus Bucks certificates you can receive. Each Bonus Bucks certificate requires the submission of three unique codes (one from each of three qualifying packages of Kellogg's products.